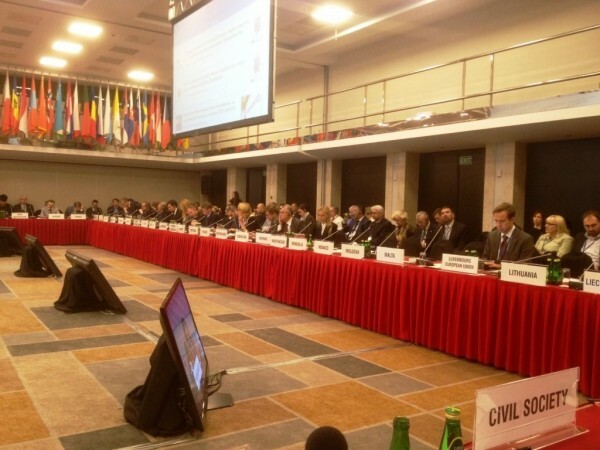 From September 21 to October 2, 2015, the OSCE held the Human Dimension Implementation meeting in Warsaw, Poland. It addressed in particular the realization of human rights in various spheres. The working meeting on September 30 addressed the problems of tolerance and non-discrimination, struggle with racism, xenophobia, including intolerance and discrimination against Christians and people of other faiths. With the blessing of His Beatitude Onufry, Metropolitan of Kiev and All Ukraine, this meeting was attended by Archpriest Nikolay Danilevich, deputy chairman of the Ukrainian Orthodox Church’s department for external church relations. Among the participants was also Rev. Roman Bogdasarov, vice-chairman of the Moscow Patriarchate department for church-society relations. In his address, the full text of which was submitted to the OSCE Office for Democratic Institutions and Human Rights (ODIHR), Archpriest Nikolay Danilevich spoke about the basic violations of the human rights of the Ukrainian Orthodox Church’s faithful. He indicated in particular that since the early 2014, there has been an increase in aggressive actions towards the Ukrainian Orthodox Church, which can be described as acts of discrimination. Thus, on January 28, 2015, the Kiev City Council made the decision to exempt religious organizations from property tax. The only exception was made for the religious communities of the Ukrainian Orthodox Church. This obviously anti-constitutional and discriminative decision was eventually annulled by a ruling of the Kiev Administrative Court on June 18, 2015. The court stressed that ‘the principles of non-discrimination, impartiality and equal attitude to all the organizations, including religious ones, as well as prevention of implications stipulating conditions less favourable compared to those provided to other individuals or groups should be also applied to regulation acts adopted by local self-governance bodies’. Such violations of rights were also committed by the Ternopol and Lvov Regional Councils. He said that while the central authorities seek to pursue a balanced religious policy, regions are noticeable for many abuses: ‘A particular sphere in which there is an increasing number of violations of the rights of believers are the so-called moves of the Ukrainian Orthodox Church’s parishes to the Kiev Patriarchate. Actually, these are forcible takeovers of our churches by the Kiev Patriarchate supporters who use political forces, local deputies, radical organizations, such as the Right Sector and Svoboda, and even a unit of the Ternopol interior ministry battalion. As of today, the Ukrainian Orthodox Church has recorded 28 captures of churches and six more are under the threat of capture and two churches have been sealed. It is not a free change of the jurisdiction in accordance with the Ukrainian law ‘On Freedom of Conscience and on Religious Organizations’ but capture with the use of force, violence and deception. Our churches are captured mostly in the regions of Volhyn, Rovno, Ternopol, Lvov and Chernovtsy’. Archpriest Nikolay cited a particular case of the seizure of a church which had lawfully belonged to the Ukrainian Orthodox Church since 1946. Among the most glaring violations by local authorities in this situation is the decision made by the police to let representatives of radical organizations, such as the Right Sector, to participate in the resolution of conflicts. Actually, the state has ‘shared’ its monopoly on the use of legal force, which is clearly regulated by the national law, with uncontrolled right-wing radical formations, thus contributing to ever greater aggravation of inter-confessional relations both on regional and national levels. ‘As a result, we see the evidently protectionist policy adopted by the authorities towards a particular confession, namely, the Ukrainian Orthodox Church of the Kiev Patriarchate. It turns out that all are equal before the law, but some are still more equal’, the priest concluded. It was also noted with particular examples that in defending its rights, the Ukrainian Orthodox Church does not encroach on the rights and property of other religious communities. In conclusion of his address, Archpriest Nikolay Danilevich stressed, ‘I am very much against using these facts for political propaganda. However, we cannot keep silent because the tendencies in Ukraine’s religious life, especially in its western part, are very disturbing. And tendencies, as is well known, are more important than facts’.